With half of his family members in the medical field, Dr Basam Ali grew up in a family who is passionate about providing health care. Dr Basam Ali graduated in 2001 from Baghdad University (College of Dentistry) with a BDS in Dentistry and Oral Surgery. In 2011 he earned a Graduate Certificate in Clinical Dentistry from Melbourne University. He also has a certificate from the Australian Dental Council (ADC) and is a member of the Australian Dental Association. To stay abreast of the latest in dentistry, Dr Basam Ali regularly takes continuing education classes. When he’s not at Green Apple Dental Clinic, Dr Basam Ali enjoys spending time with his wife, who also is a dentist, and their four children (two boys and two girls). All of the kids are soccer players. He also plays indoor soccer as well as billiards. Dr Basam Ali is also a businessman and chef, who enjoys cooking food for his family and friends. 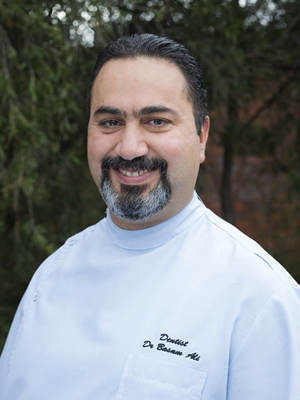 Contact the practice today to book an appointment with Dr Basam Ali!